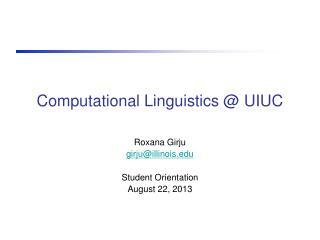 Introduction to Computational Linguistics. 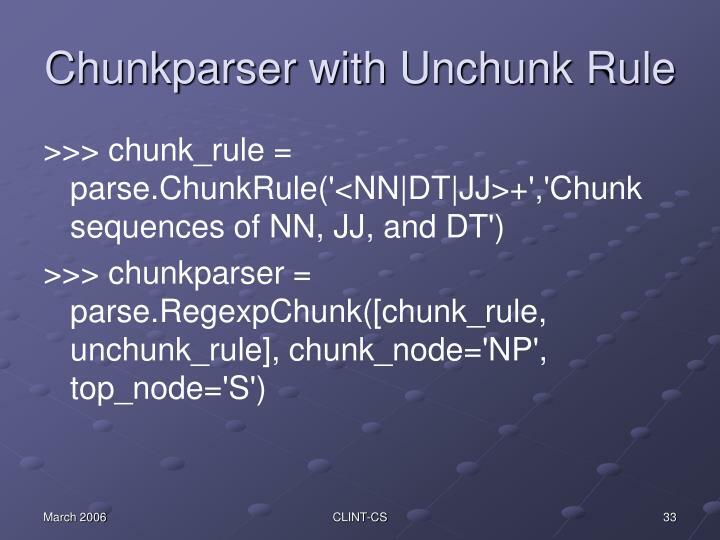 Chunk Parsing. Sources. 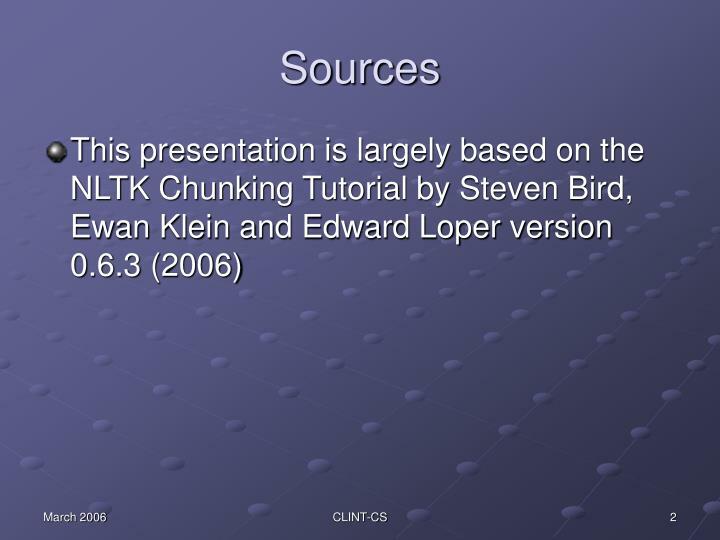 This presentation is largely based on the NLTK Chunking Tutorial by Steven Bird, Ewan Klein and Edward Loper version 0.6.3 (2006). 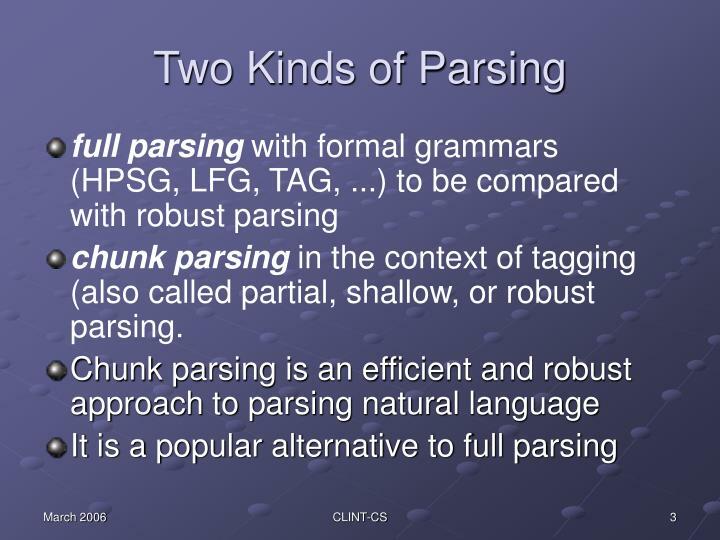 Two Kinds of Parsing. 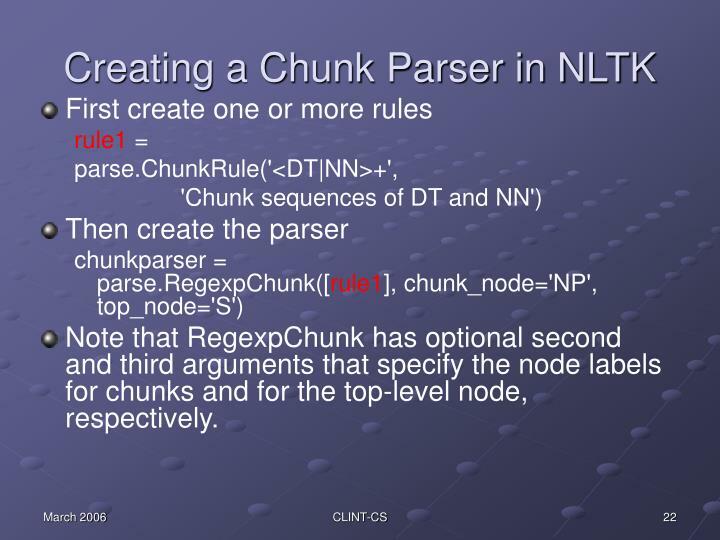 chunk parsing in the context of tagging (also called partial, shallow, or robust parsing. 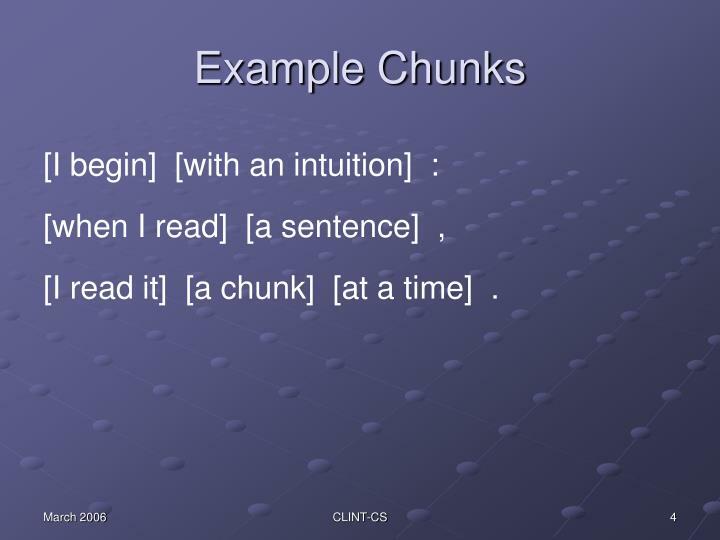 [I read it] [a chunk] [at a time] . 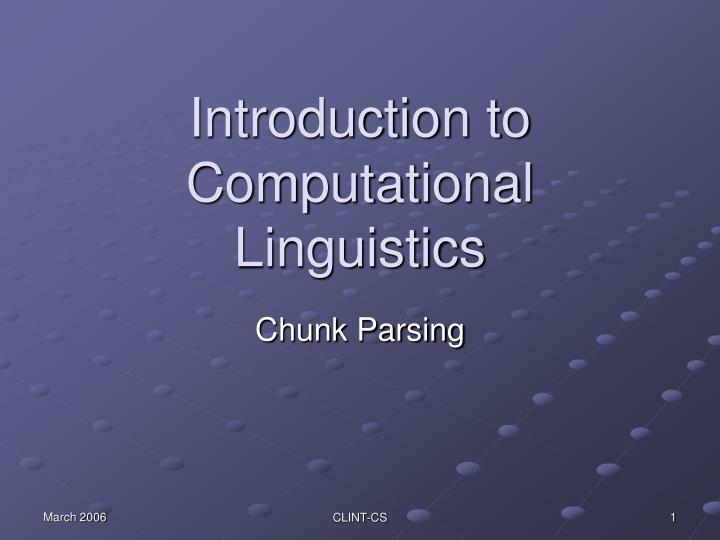 These chunks correspond in some way to prosodic patterns. 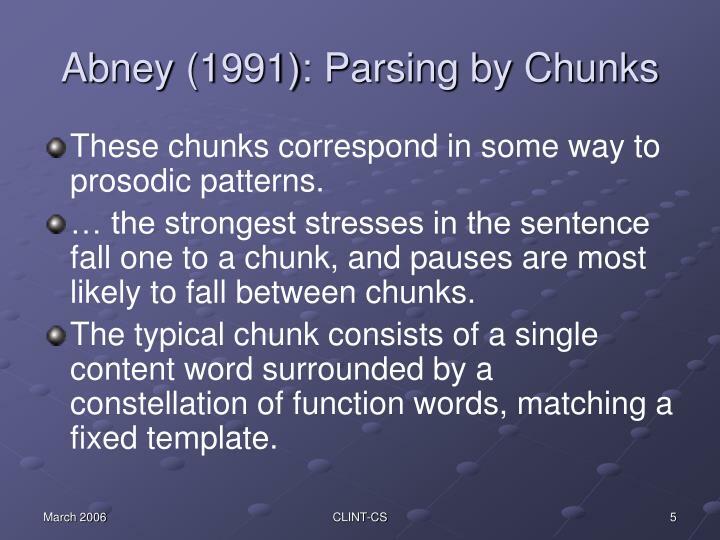 … the strongest stresses in the sentence fall one to a chunk, and pauses are most likely to fall between chunks. 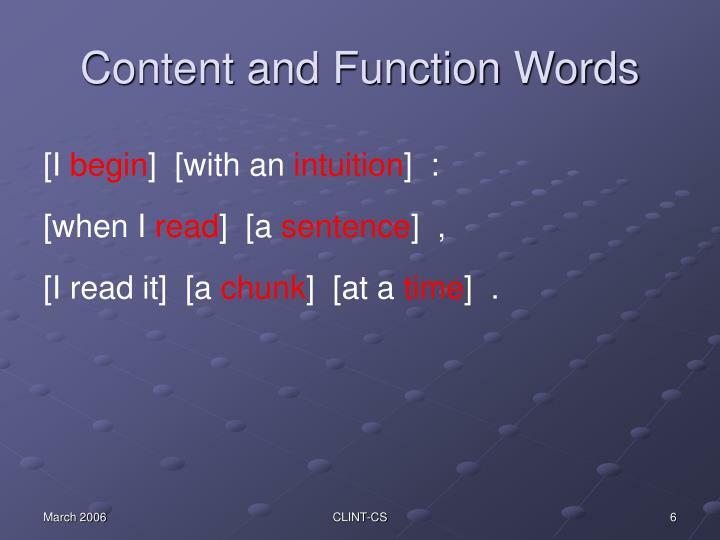 The typical chunk consists of a single content word surrounded by a constellation of function words, matching a fixed template. 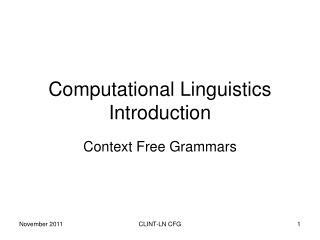 A simple context-free or finite state grammar is quite adequate to describe the structure of chunks. 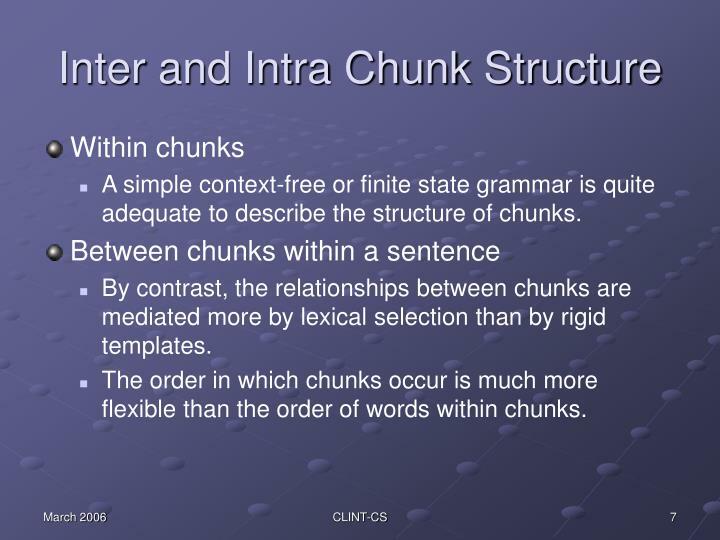 By contrast, the relationships between chunks are mediated more by lexical selection than by rigid templates. 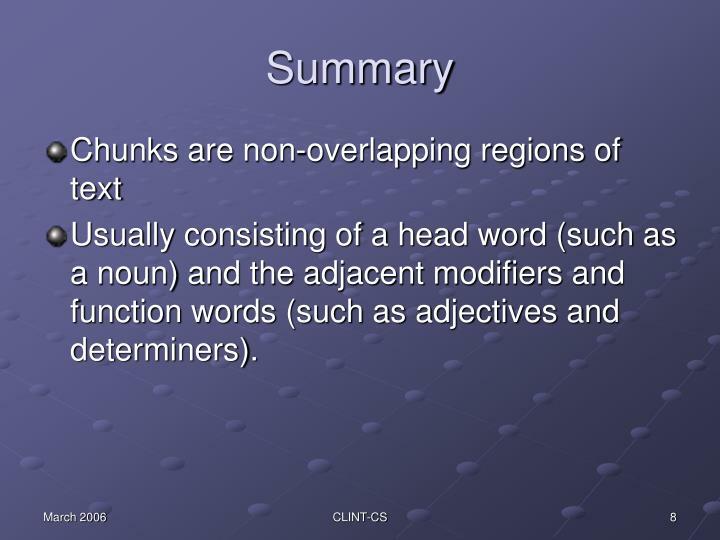 The order in which chunks occur is much more flexible than the order of words within chunks. 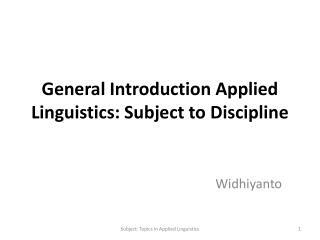 Usually consisting of a head word (such as a noun) and the adjacent modifiers and function words (such as adjectives and determiners). Each token is tagged with one of three special chunk tags, INSIDE, OUTSIDE, or BEGIN. 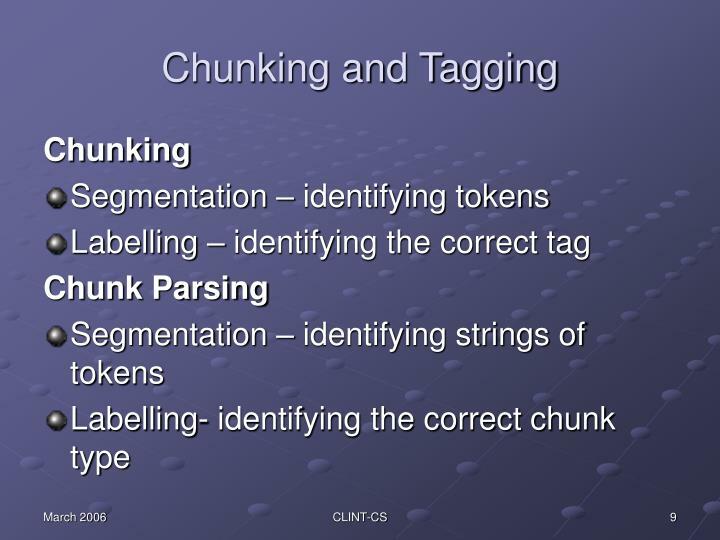 A token is tagged as BEGIN if it is at the beginning of a chunk, and contained within that chunk. 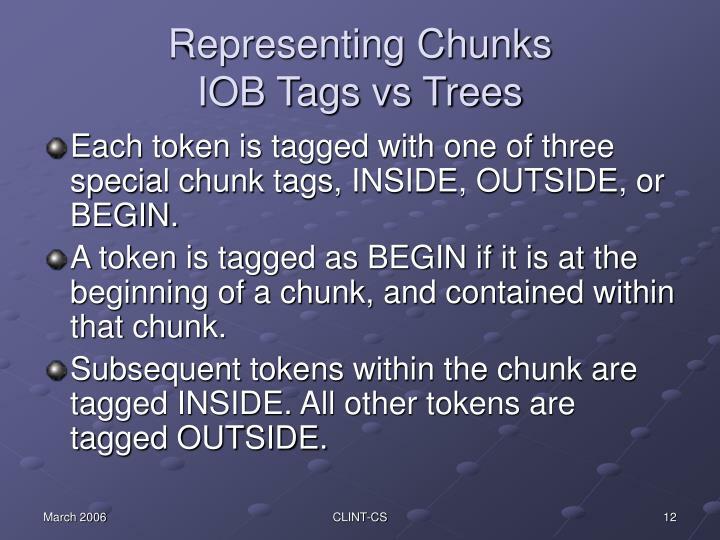 Subsequent tokens within the chunk are tagged INSIDE. 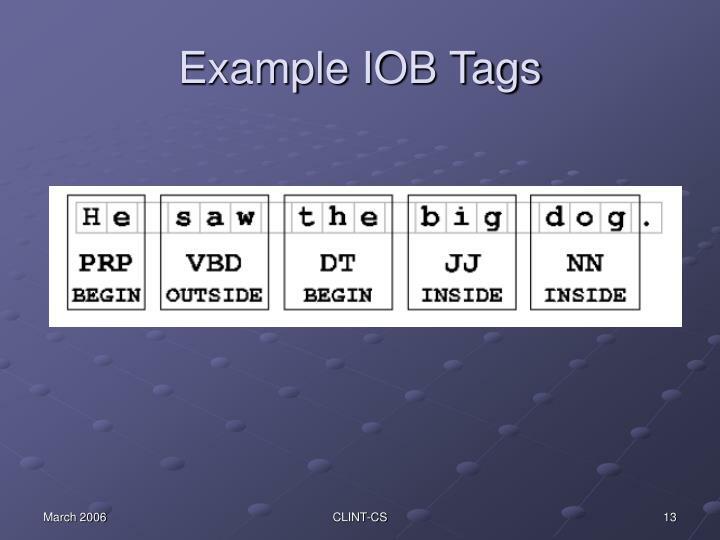 All other tokens are tagged OUTSIDE. 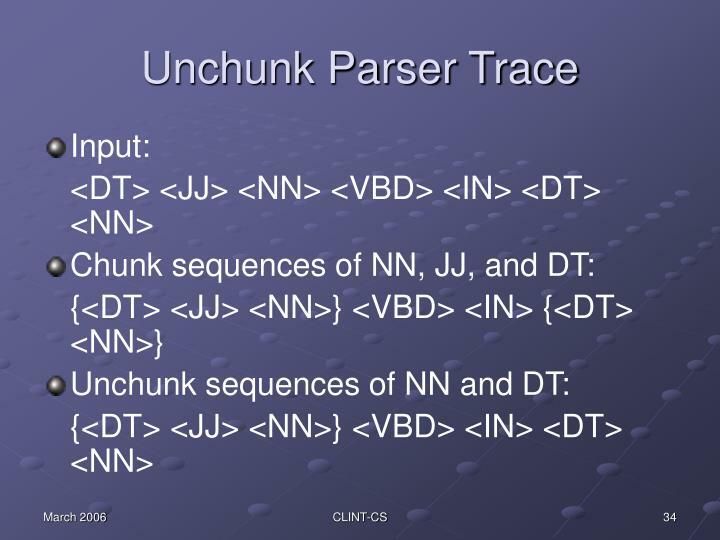 A chunk parser finds contiguous, non-overlapping spans of related tokens and groups them together into chunks. 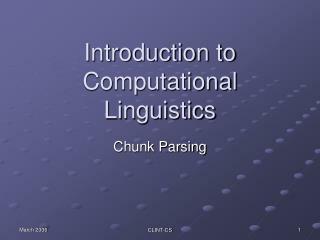 It then combines these individual chunks together, along with the intervening tokens, to form a chunk structure. 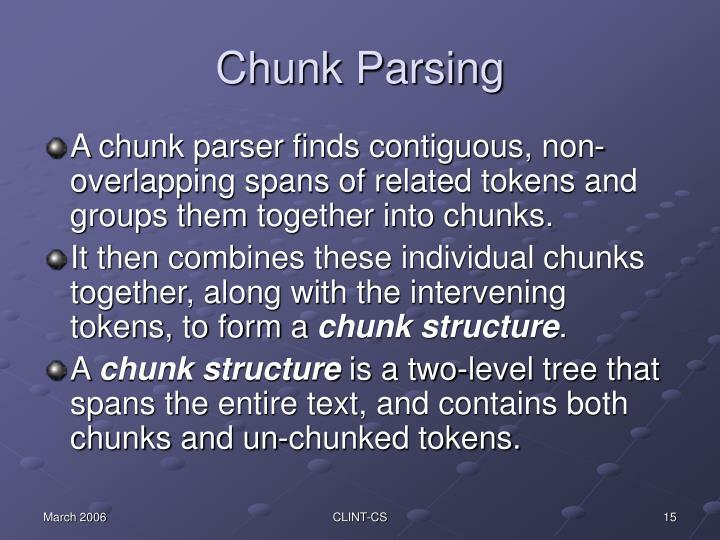 A chunk structure is a two-level tree that spans the entire text, and contains both chunks and un-chunked tokens. 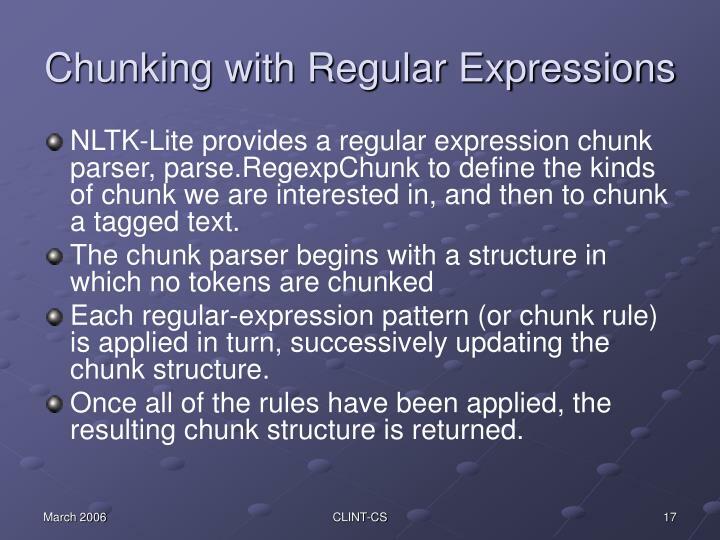 NLTK-Lite provides a regular expression chunk parser, parse.RegexpChunk to define the kinds of chunk we are interested in, and then to chunk a tagged text. 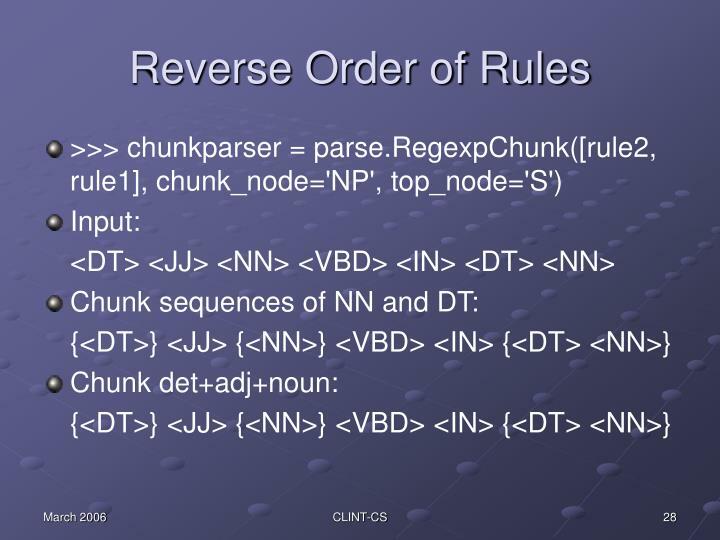 Each regular-expression pattern (or chunk rule) is applied in turn, successively updating the chunk structure. 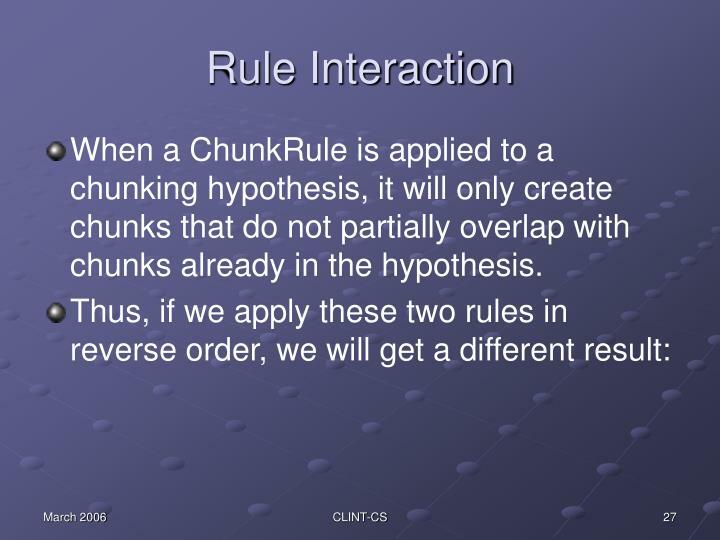 Once all of the rules have been applied, the resulting chunk structure is returned. 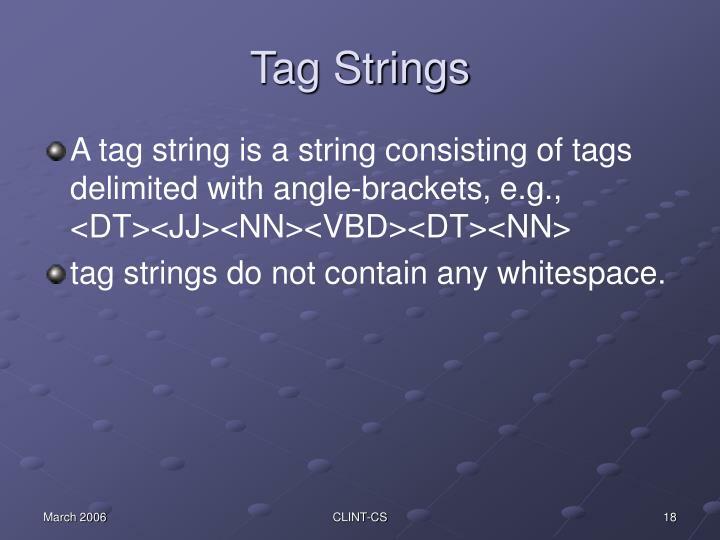 tag strings do not contain any whitespace. 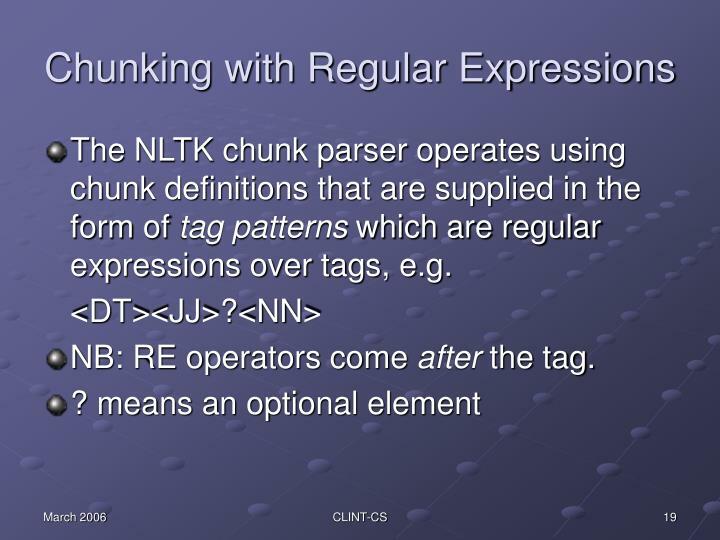 The NLTK chunk parser operates using chunk definitions that are supplied in the form of tag patterns which are regular expressions over tags, e.g. 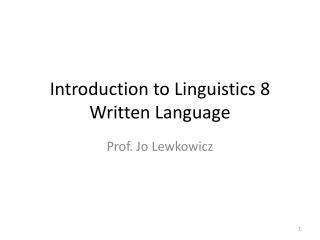 NB: RE operators come after the tag. 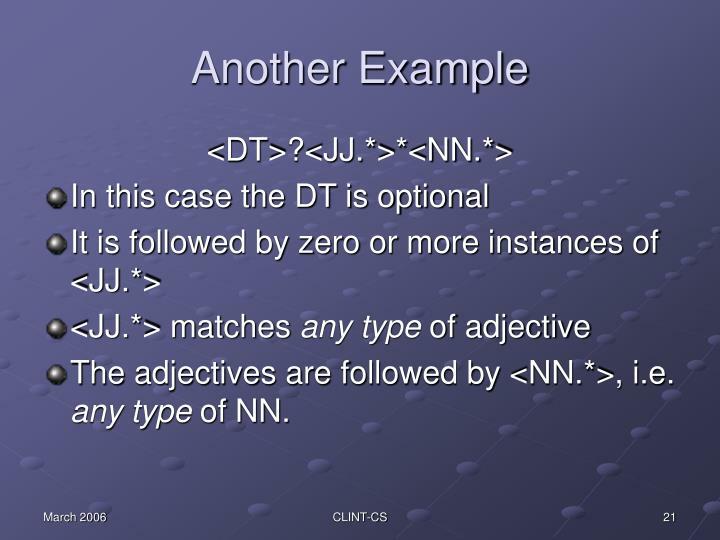 Angle brackets group, so <NN>+ matches one or more repetitions of the tag string <NN>; and <NN|JJ> matches the tag strings <NN> or <JJ>. 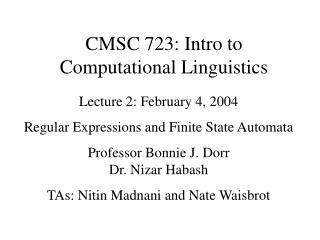 The operator * within angle brackets is a wildcard, so that <NN. 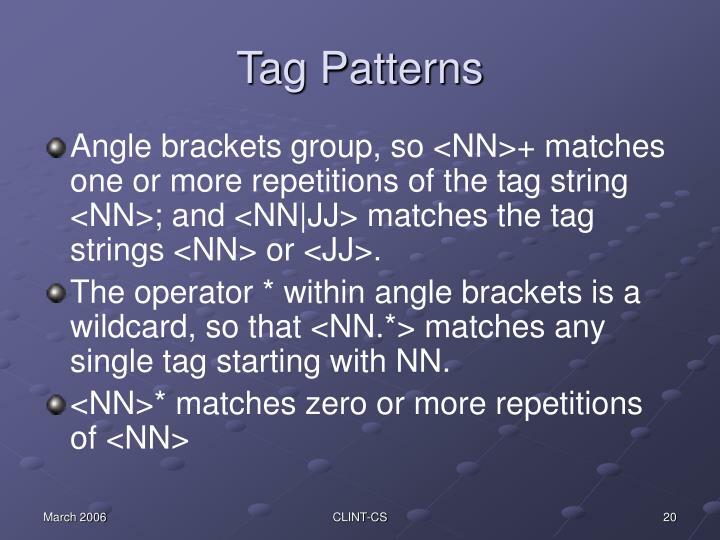 *> matches any single tag starting with NN. 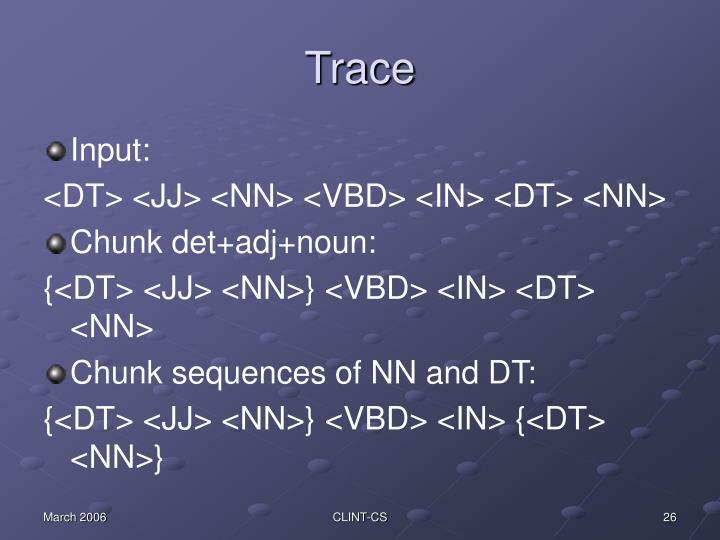 The adjectives are followed by <NN. 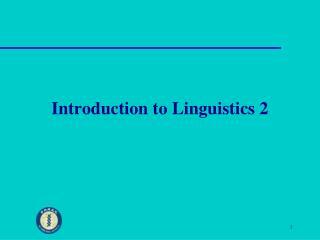 *>, i.e. 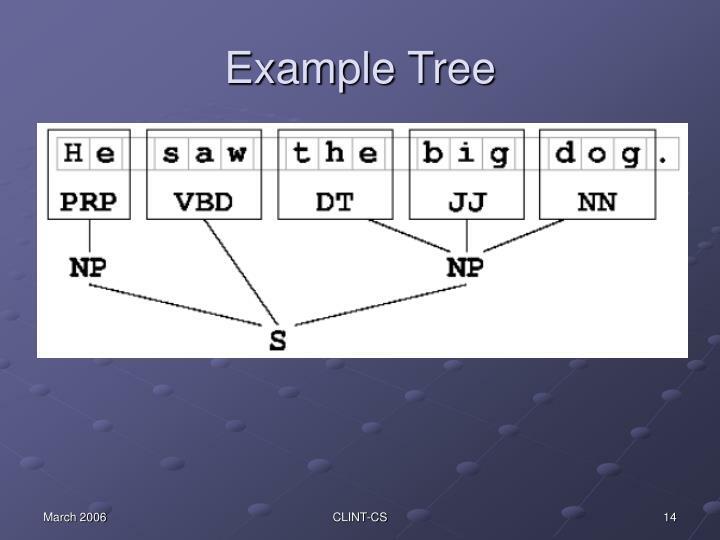 any type of NN. 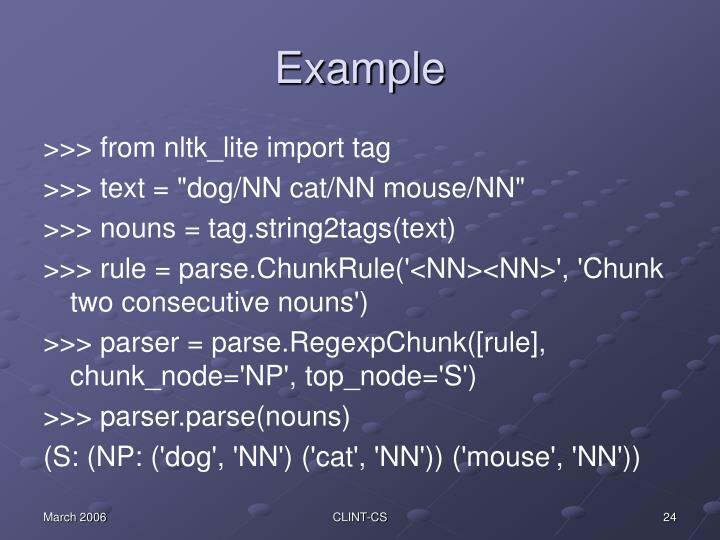 Note that RegexpChunk has optional second and third arguments that specify the node labels for chunks and for the top-level node, respectively. 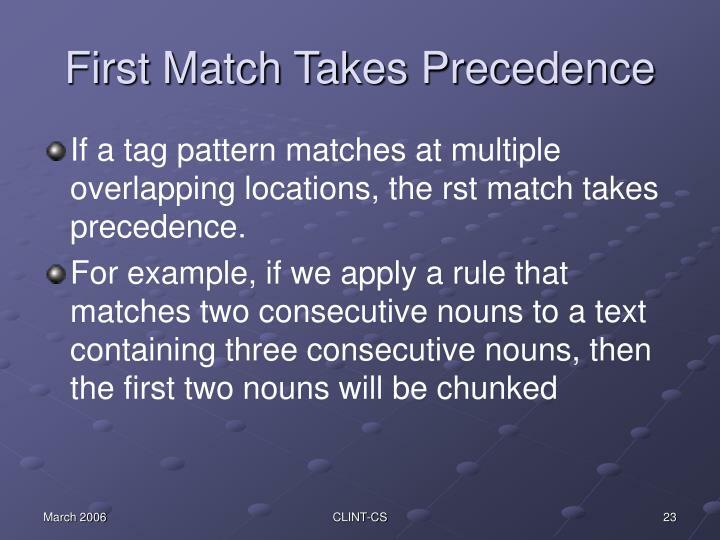 If a tag pattern matches at multiple overlapping locations, the rst match takes precedence. 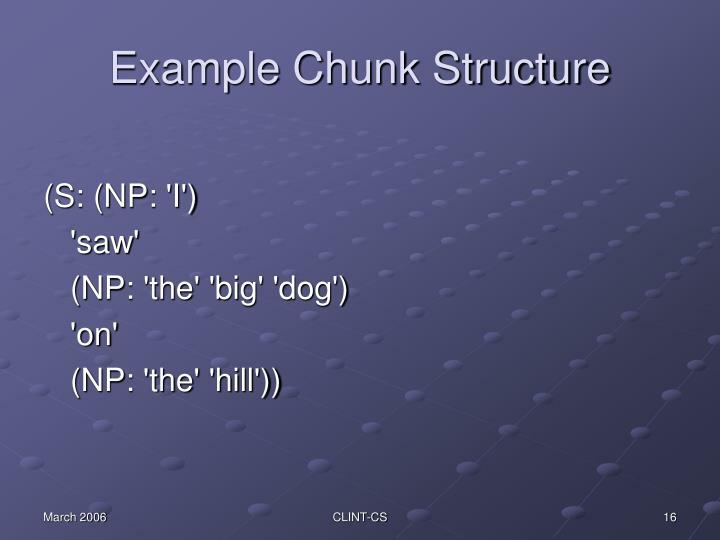 >>> text = "dog/NN cat/NN mouse/NN"
When a ChunkRule is applied to a chunking hypothesis, it will only create chunks that do not partially overlap with chunks already in the hypothesis. 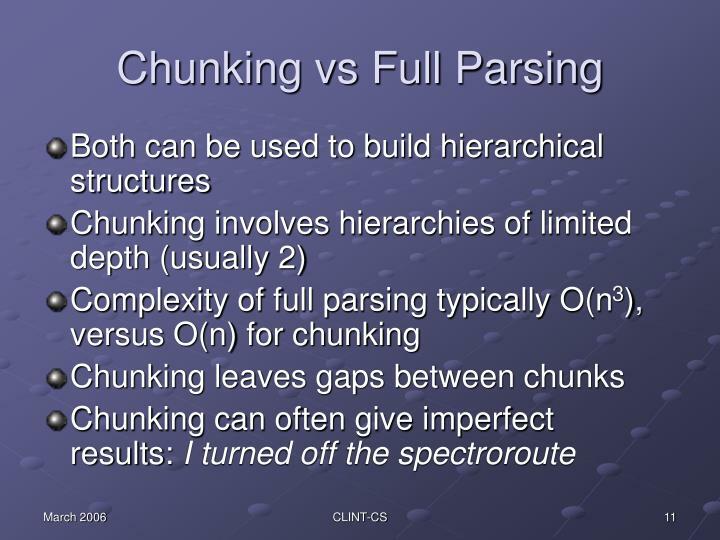 Sometimes it is easier to define what we don't want to include in a chunk than we do want to include. 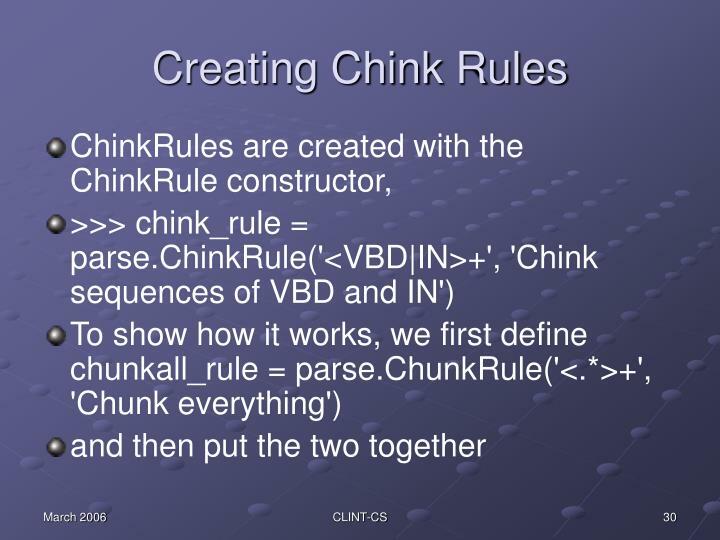 Chinking is the process of removing a sequence of tokens from a chunk. 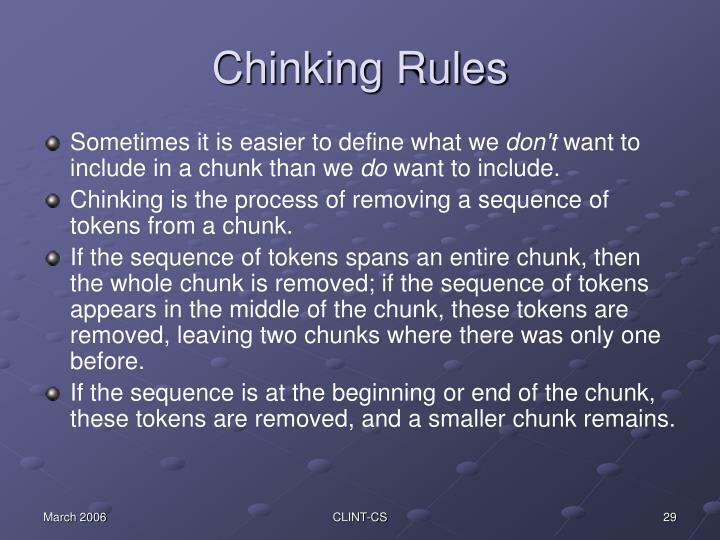 If the sequence of tokens spans an entire chunk, then the whole chunk is removed; if the sequence of tokens appears in the middle of the chunk, these tokens are removed, leaving two chunks where there was only one before. If the sequence is at the beginning or end of the chunk, these tokens are removed, and a smaller chunk remains. 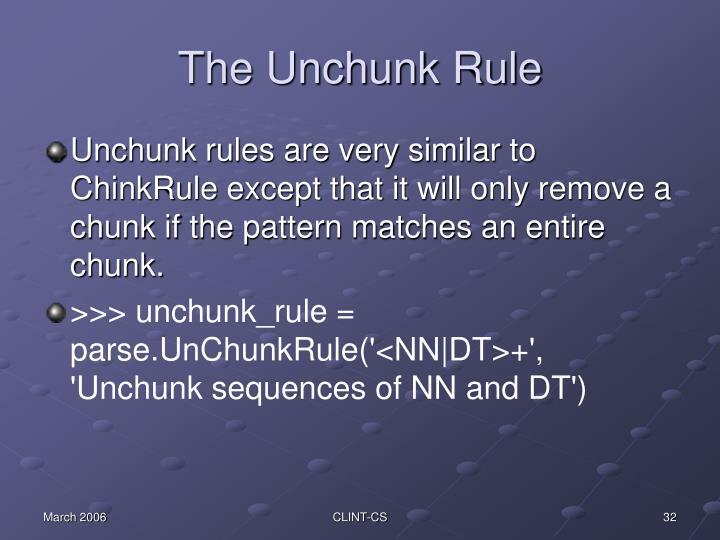 Unchunk rules are very similar to ChinkRule except that it will only remove a chunk if the pattern matches an entire chunk. 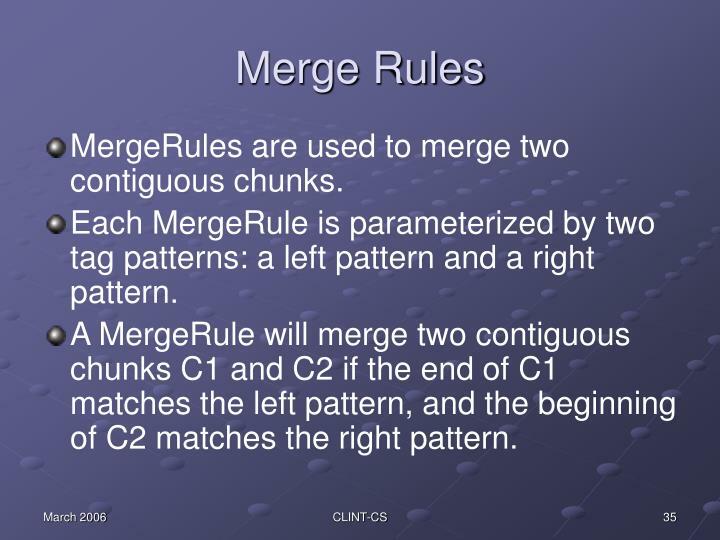 MergeRules are used to merge two contiguous chunks. 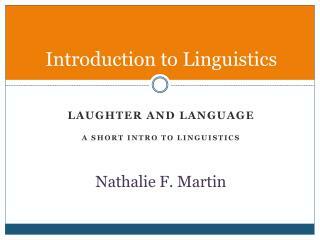 Each MergeRule is parameterized by two tag patterns: a left pattern and a right pattern. 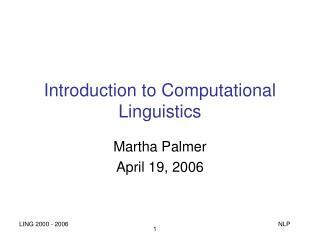 A MergeRule will merge two contiguous chunks C1 and C2 if the end of C1 matches the left pattern, and the beginning of C2 matches the right pattern. 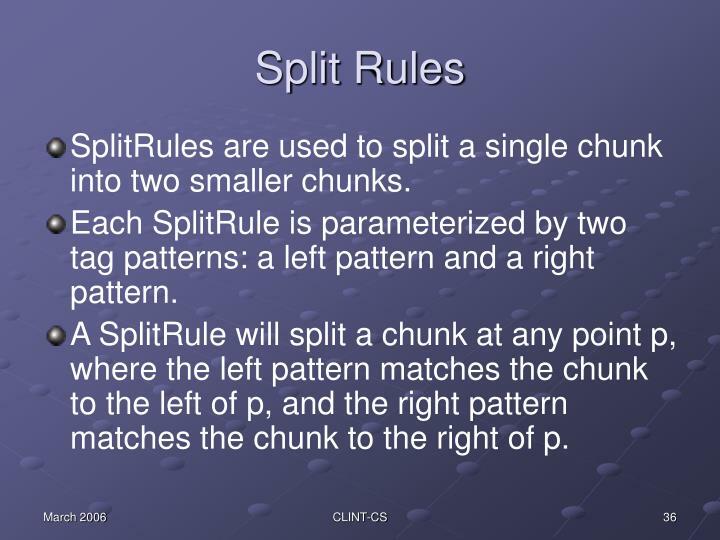 SplitRules are used to split a single chunk into two smaller chunks. 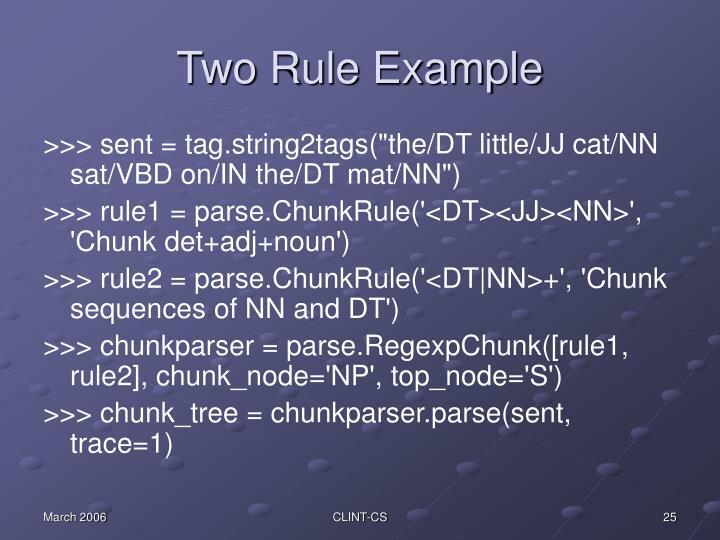 Each SplitRule is parameterized by two tag patterns: a left pattern and a right pattern. 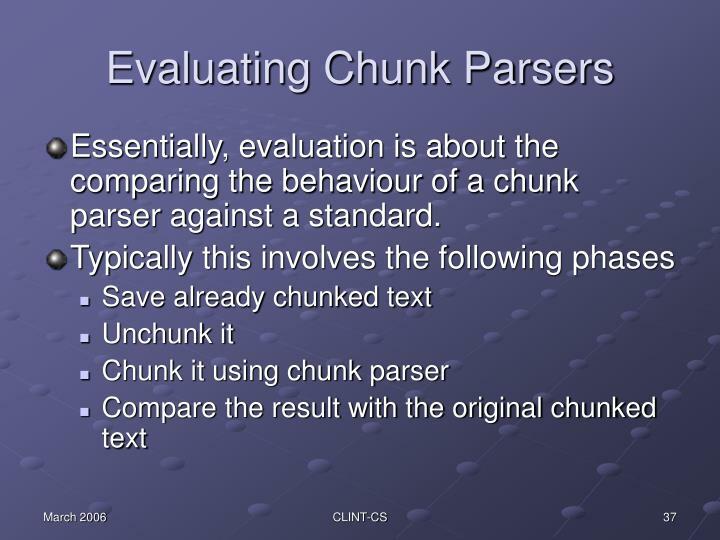 A SplitRule will split a chunk at any point p, where the left pattern matches the chunk to the left of p, and the right pattern matches the chunk to the right of p.
Essentially, evaluation is about the comparing the behaviour of a chunk parser against a standard. 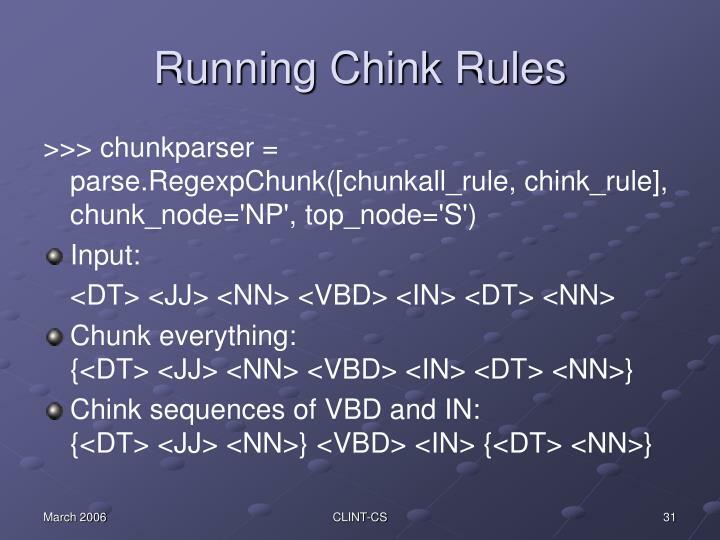 guessed: The set of chunks returned by the chunk parser. 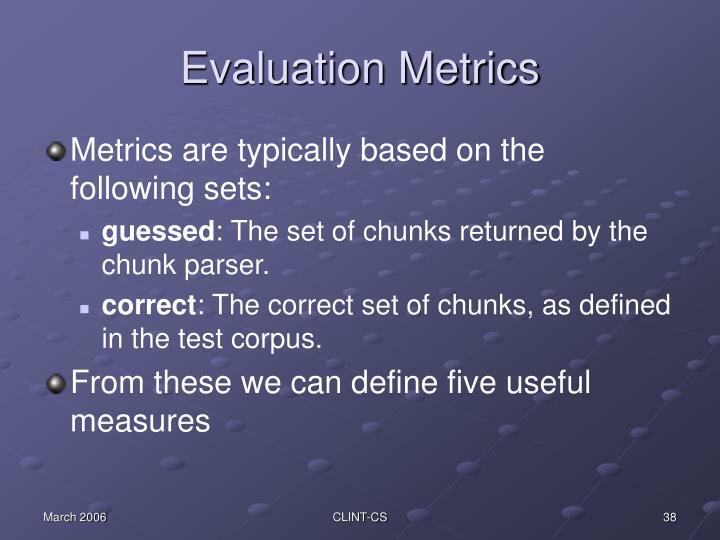 correct: The correct set of chunks, as defined in the test corpus. 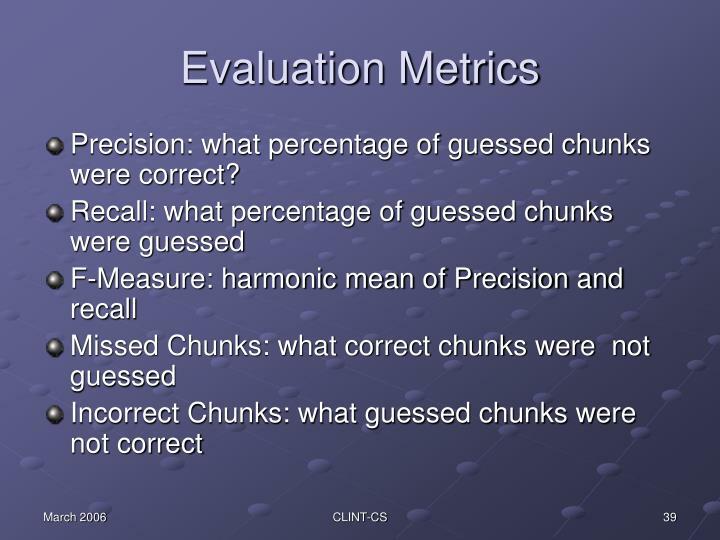 Precision: what percentage of guessed chunks were correct? 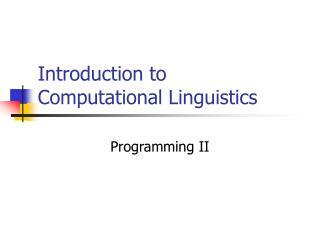 Computational Linguistics -. 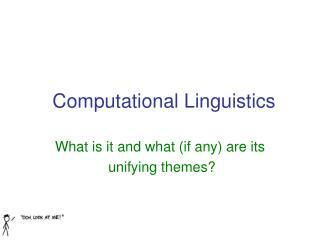 what is it and what (if any) are its unifying themes?. 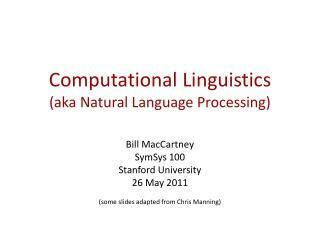 computational linguistics. i often agree with xkcd…. 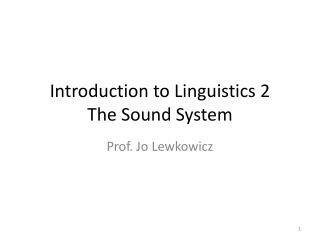 linguistics?. 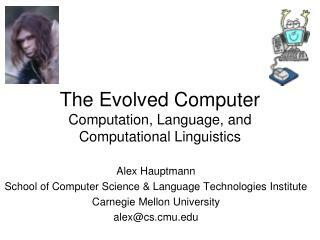 computational linguistics. physics. chemistry. biology. 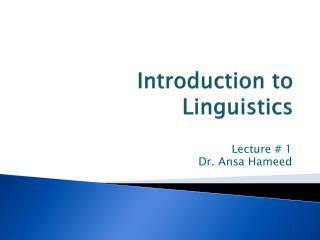 neuropsychology. psychology. 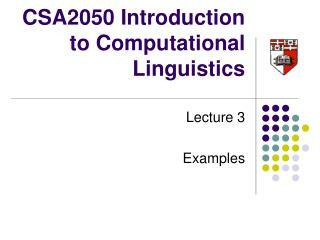 CSA2050 Introduction to Computational Linguistics -. 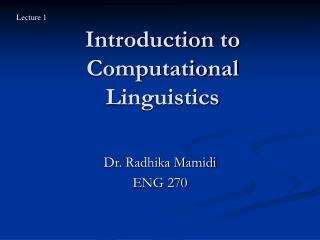 lecture 3 examples. 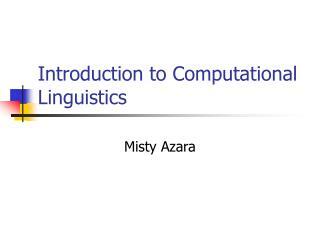 course contents. outline. 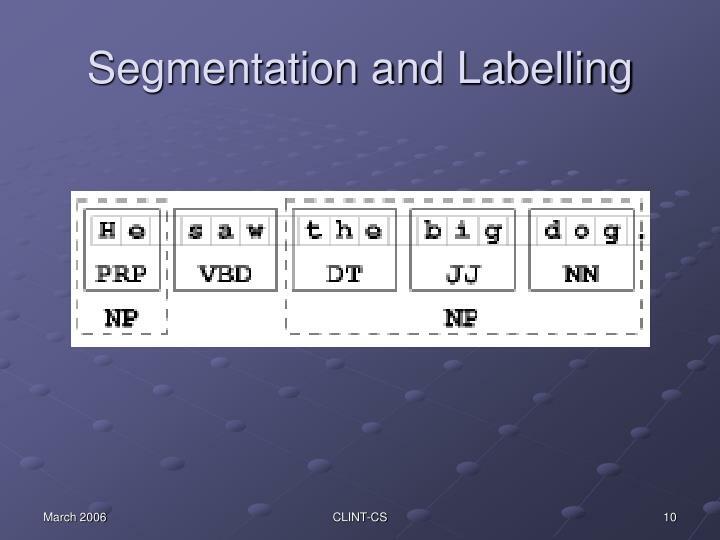 examples in the areas of tokenisation morphological analysis tagging syntactic analysis. information extraction. raw text. tokenisation. 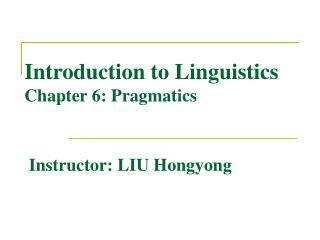 Introduction to Linguistics Chapter 6 : Pragmatics -. 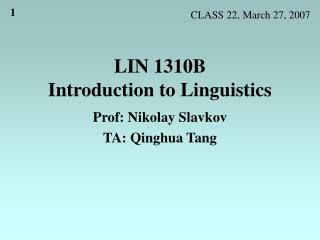 instructor: liu hongyong. 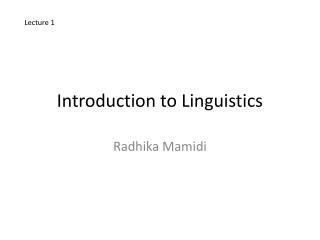 review: w hat is semantics?. 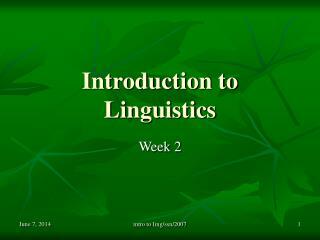 semantics is the study of meaning. 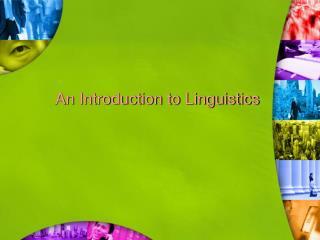 more specifically, semantics is the study of the meaning of words and sentences in particular.